In an effort to learn how to use variables in Articulate Storyline 2, I recreated Verizon's ﻿Build Your New Plan﻿ calculator. I decided to use a slider to select how many smartphones are needed and buttons to choose a data plan. When the user clicks calculate, the program will calculate the cost of a 2 year contract and the cost of the Verizon Edge financing plan. The variable, Smartphones, is the number of smartphones needed and has an initial value of 1. It automatically changes value based on the location of the slider. Data Plan has an initial value of zero and is set by selecting a data plan size. The monthly fee for each smartphone on a 2 year contract is $40, so the default value of variable, 2Yr40, is set to 40 and does not change. The monthly fee for each smartphone on the Edge plan is $25, so the default value of variable, Edge25, is set to 25 and does not change. 2YrCost is the total cost of a 2 year contract. It has an initial value of zero and is calculated when the user clicks calculate. EdgeCost is the total cost of an Edge plan. It has an initial value of zero and is calculated when the user clicks calculate. 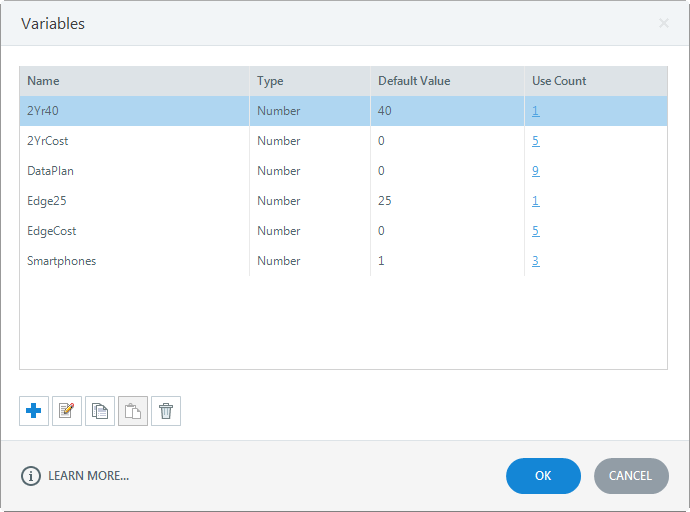 The first set of triggers set the variable, DataPlan, equal to the data plan size the user selects. 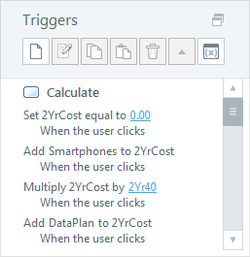 The second set of triggers calculates the total cost of a 2 year contract when the user clicks calculate. The total cost of a 2 year contract is set to zero to clear out any prior calculations. The second trigger adds the number of smartphones to the total cost of a 2 year contract. The total cost of a 2 year contract which is now set to the number of smartphones is multiplied by $40 (the monthly fee for each smartphone). This gives the total monthly service cost of all the smartphones. Then the cost of the data plan is added to the total monthly service cost of the smartphones. The total cost of a 2 year contract is then output onto the screen for the user to see. 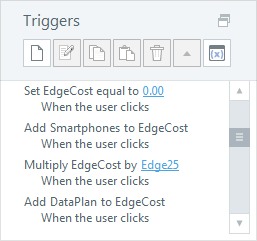 The third set of triggers calculates the total cost of the Edge financing plan when the user clicks calculate. The total cost of the Edge plan is set to zero to clear out any prior calculations. The second trigger adds the number of smartphones to the total cost of the Edge plan. The total cost of the Edge plan which is now set to the number of smartphones is multiplied by $25 (the monthly fee for each smartphone). This gives the total monthly service cost of all the smartphones. The total cost of the Edge plan is then output onto the screen for the user to see.